"Portland, Me. Deering Oaks Park and Pond"
General view of Deering Oaks Park and pond, from southwest. "Castle" at left; swan boat at center; footbridge at right. Circa 1900s. "Portland, Me. 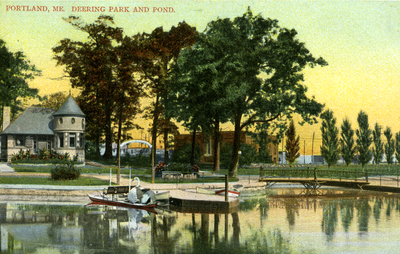 Deering Oaks Park and Pond" (2013). Portland Postcards. 26.